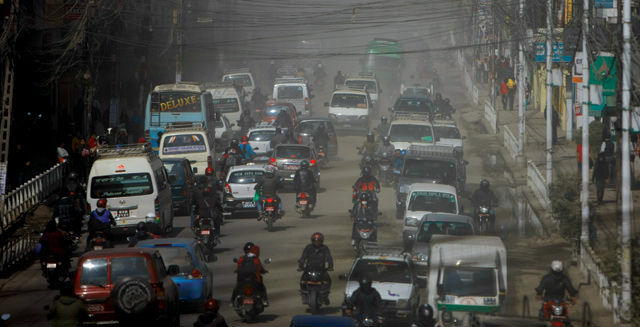 With winter approaching, Kathmandu Valley’s air pollution gets worse as the inversion layer traps dust and vehicle emissions. The mountains disappear, flights are delayed and city-dwellers develop persistent coughs. It didn’t use to be like this. Winter was the time of deep blue skies and dazzlingly clear views of the Himalayan peaks to the north. This year, Kathmandu did not even have to wait for winter for the air pollution to become hazardous thanks to a combination of smoke from crop residue burning in the Indian plains, and dust from Kathmandu’s earthquake reconstruction and never-ending road-widening project. What is most alarming is the looming health catastrophe triggered by this perpetual pollution. Hospitals report a surge in patients with chronic obstructive pulmonary disease, emphysema and even lung cancer. Source: Drishti The PM 2.5 levels that are being compared were recorded on the first day of each month. 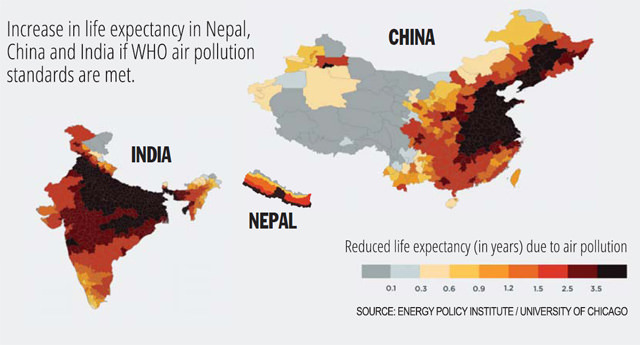 An online survey by Code For Nepal, #BreatheFreely, sheds light on the negative consequences of breathing this toxic air. Not surprisingly, most of the responses were from Kathmandu Valley. Of the 789 answers collected earlier this year, a staggering 76% stated that their health has been affected by the air pollution. Most cited were breathing problems, chest pain and eye infection. ‘I can’t walk or ride my motorbike freely. I have to cover my whole body, from head to toe, just to block out the dust. If I don’t use a mask, I’ll have to suffer from the ensuing tonsilitis and dust allergy,’ wrote one respondent. Nearly 64% of respondents stated that they used masks on a daily basis. While air pollution is a round-the-clock problem, most said the period between 12-4pm was when the air quality was worst, probably because that is whenthey were out and about. Data collected from air monitoring stations by the group, Drishti, showed daily peaks in PM2.5 (the most harmful particles less than 2.5 microns in diameter) in the mornings and evenings in winter at 10 measurement stations in Kathmandu Valley. Drishti’s data also show that PM2.5 levels were highest from January to March 2016, reinforcing how inversion during winter months creates a dust-bowl effect, increasing the concentration of pollutants. The levels of fine particles were significantly higher between 8-11am. On 1 January 2017, PM 2.5 levels saw a high of 170.28µg/m³, much higher than the universally-accepted level of 15µg/m³. Between 7am-11am, PM 2.5 stayed consistently above 104µg/m³. With 10% more vehicles on the roads than last year, pollution will be even worse this winter. a. Complete all the infrastructure development projects happening in Kathmandu asap (Melamchi project, road expansion, etc). b. Motivate citizens to use public transport. b. Zero tolerance of polluting vehicles with emission checks. c. A mass awareness campaign through media and ground level volunteers highlighting health hazards. Your favourite fortnightly food fadist takes a walk on the Newari wild side. Am I to be the last to eat from the family plate while my dear mother feeds you the choicest fare?